It is inexpensive, easy to cook with, and delicious. 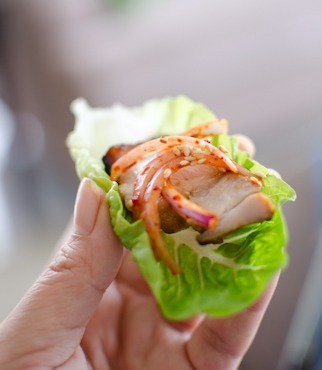 We call this layered belly part of pig, “Samgyupsal, 삼겹살”. There are two most popular ways to enjoy this delicious pig in Korea. One: Slice to bite size pieces and grill. Serve with lettuce and pungent topping sauce. This is the typical Samgyupsal dish. Two: Braise the whole chunk with a bunch of herbs in water, then slice and serve with spicy salad. This particular dish is called Bossam(보쌈). 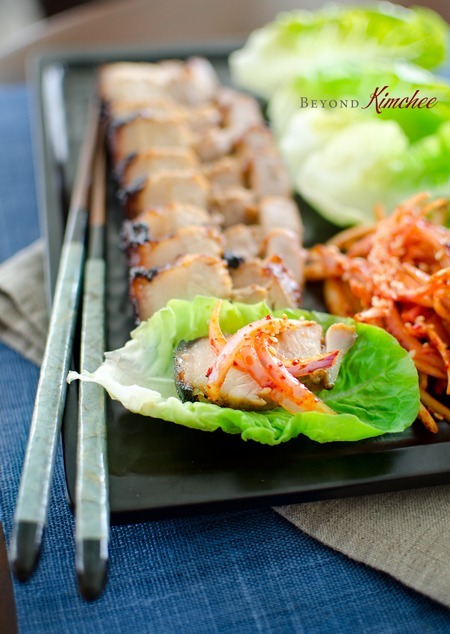 Today, I am throwing a Korean Pork Belly recipe that is easy and quick to prepare at home. But I won’t grill nor braise. I am going to roast my pig in an oven. I am using the western method of cooking but flavoring the belly with Korean ingredients. I will slobber the belly with the lovely Korean soy bean paste sauce to flavor the pork. How do you like that? The result? The succulent pig with crisp skin and it is oh, so delicious! 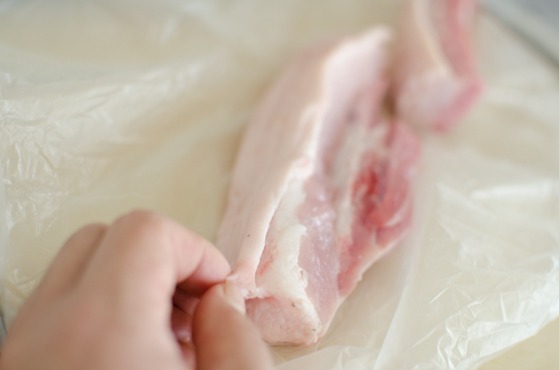 Most pork belly chunks comes with skin. I would like to keep it because it will get very crisp and keep the meat underneath moist during cooking. If you don’t want it, simply, just remove it. 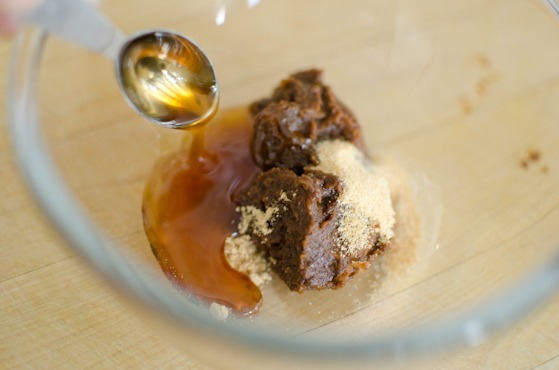 In a small mixing bowl, combine Korean soy bean paste, garlic powder, ginger powder, and honey. Oh, I forgot to add some oil. Now the sauce is ready. Bring on the belly! Spread the belly with the sauce all over. Let it sit for 15 minutes on the counter so that it will flavor the meat. Drizzle a little more oil on top to crisp up the skin even more. Bake in the preheated 425F oven for 10 minutes, then reduce the heat to 350F and continue to bake for 20-30 more minutes depends on the thickness of your meat. My pig was slim and he was done within 30 minutes total. NOTE: If you are using a slab of thick pork belly, it will take whole lot longer. Adjust the baking time accordingly. Meanwhile, let’s make the onion salad. Slice red onion and yellow onion very thinly. Soak them in cold water for 10 minutes. That will not only crisp up the onion, but also get rid of spiciness/bitterness of onion a little bit. 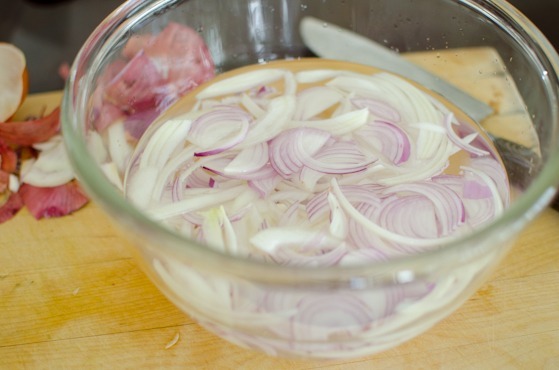 Drain water from the onions and coat with the dressing. Done! When the pork belly is done, cool down a little. Then, slice beautifully…, any thickness your mouth desire. 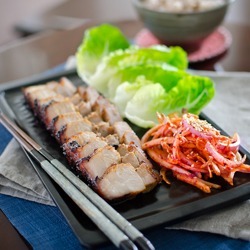 Place a slice of your lovely pork on a leafy lettuce and top with onion salad. Put it in your mouth lightning fast before anyone sees you. I was never been a huge fan of pork belly, but now I believe. PORK BELLY IS GOOD! Pork! You are truly the other white meat. I love you. In ca small bowl combine soy bean paste, honey , garlic powder, ginger powder, and 1 teaspoon of oil. Mix well. 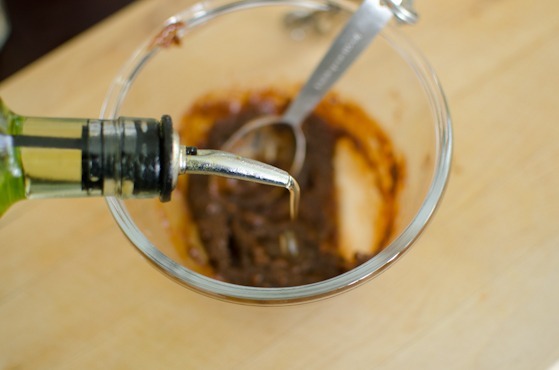 Spread the paste mixture to pork belly and rub all around. Let it sit for 15 minutes on the counter. Preheat oven to 425ºF. 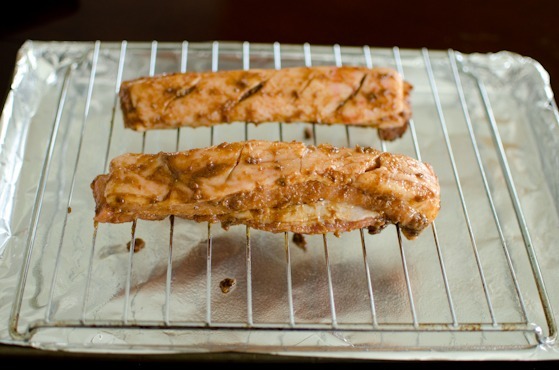 Spray a rack with oil and place over baking pan (line the pan with foil for easy clean up). 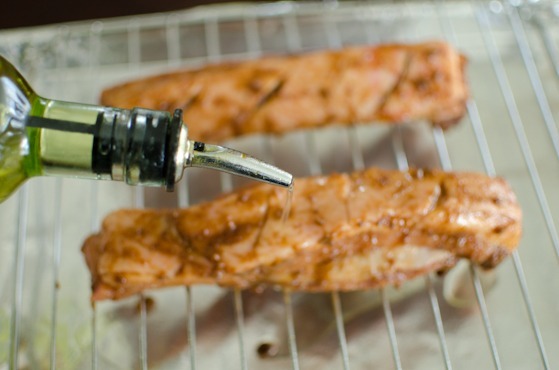 Put the pork belly on the rack and drizzle a little more oil on top. Bake in the hot oven for 15 minutes. 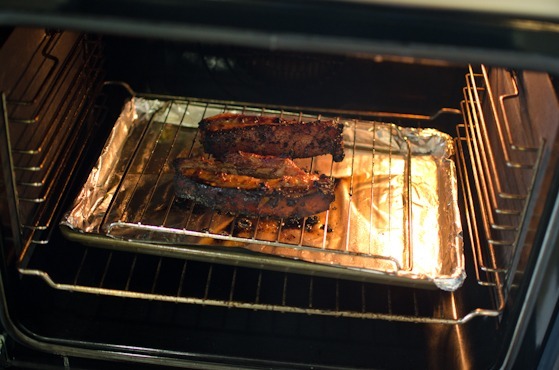 Reduce the heat to 350ºF and continue to bake for 20-30 minutes depends on the thickness of the meat. I used the very slim cut of pork belly which took very short time, about 30 minutes total. 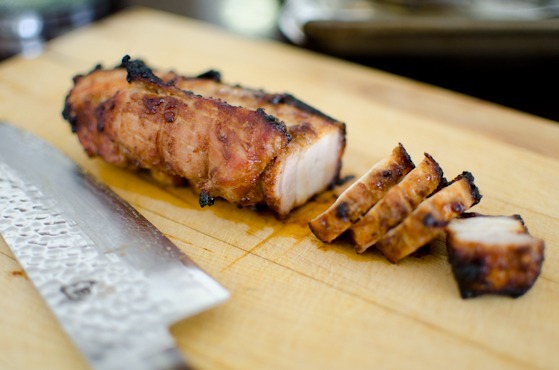 If using a slab of pork belly, it should take far longer. When inserted with a meat temperature, it should be around 165ºF. Let the pork rest for a few minutes, then slice into desired size. Serve with onion salad over lettuce. 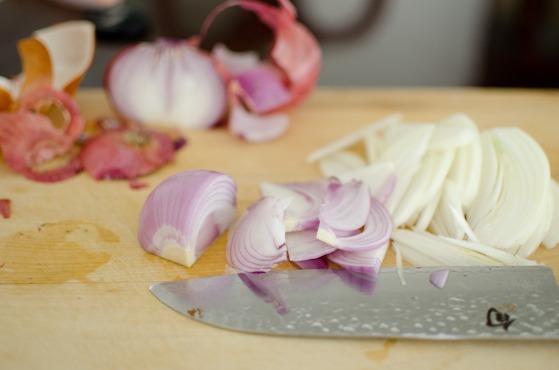 To make onion salad, soak the onion slices in cold water for 10 minutes. Drain well. 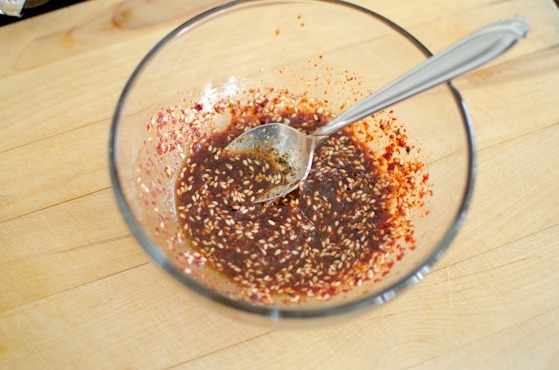 Combine chili flakes, sugar, soy sauce, cinder vinegar, sesame oil, and sesame seeds in a bowl. 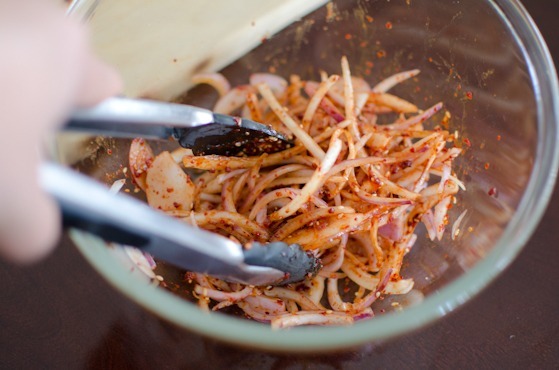 Toss the onions with the dressing. Wonderful dish! I love pork belly, but usually cook it in Chinese recipes. I've never tried a Korean version, and I need to do that. This looks so terrific - great flavor. Really good stuff - thanks. Looks so tasty! Never used Korean soy bean paste as a marinade sauce before. What a great idea! Thank you, Sue. 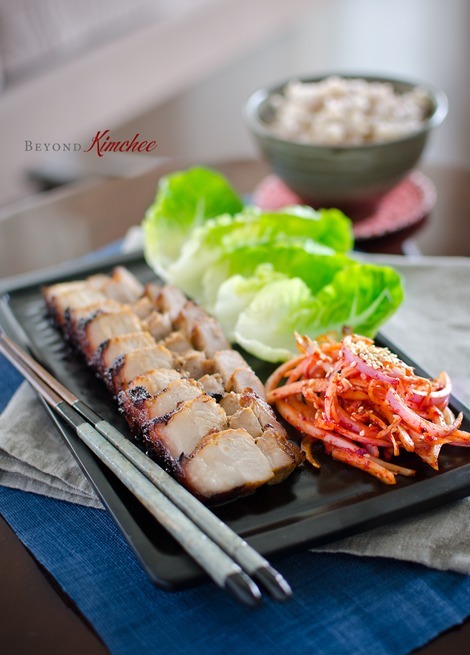 Korean soy bean paste brings great flavor to the pork belly. Hope you get to try it. presentation is gorgeous! i love the simplicity and colors. also i love 삼겹살, so i can't wait to try this. thanks. I have been learning the Korean language and culture. I wanted to try cooking a Korean dish for my family. This looks amazing! I think I will try this! Thank you for posting. This looks so delicious! Pinned to my board for future reference! Can't help drooling over the roast pork. Never tried eating it with the onion salad though. Great clicks! Gosh i am reading your blog and am totally inspired to go out and purchase some additional ingredients to try some of them out even though I am all prepped for Sunday supper :) Thanks so much. 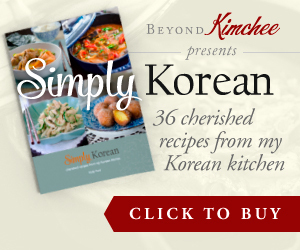 I have list of your recipes that I want to try already> I am also lucky to have a decent Korean supermarket 20 minutes away and a wide choice of Asian ingredients in other local Asian stores. Yay! Great to hear that you and your man both loved the dish. Thanks for the sweet comment, Diana. 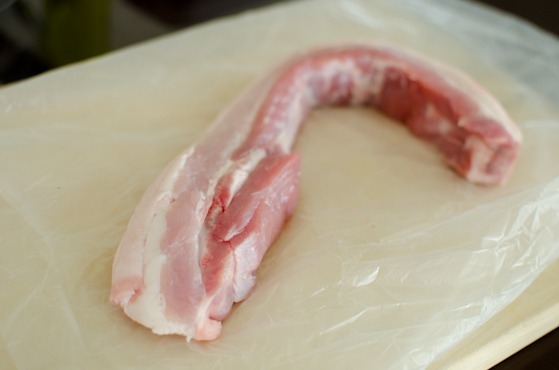 Would this recipe work with pork tenderloin? Pork belly is a little too fatty for my taste. 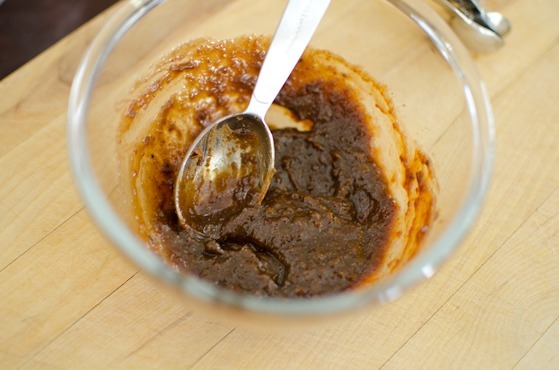 Can I replace Soy bean paste with Korean chili paste for spiciness? Hi, can I cook this without the rack directly on the pan or does it need to be baked on the rack? Thank you! Yes, you can cook it directly on the pan. It will sit on a little bit of its on juice (pork belly fat) though. Pretty great post. I simply stumbled upon your blog and wished tto mention that I have really enjoyed surfing around your weblog posts. After all I will be subscribing on your rrss feed and I am hopikng you write once more soon! I tried this 2 weeks ago and it was delicious!! <3 I'm making it again today because people in the household are craving for it! That is so great. They are good, aren't they? Delicious! Very simple to do and eat w onion salad and kimchee.. This may be the best thing I ever made.....WOW!!!! How wonderful! So glad to hear that you liked it. Thanks. Thanks for the great recipes!. I have made this dish for my family and they love it. I had trouble with the duenjang marinade falling off the pork belly because of the fat drippings. Enough remained to give flavor to the meat, but not as strong as it could have been. 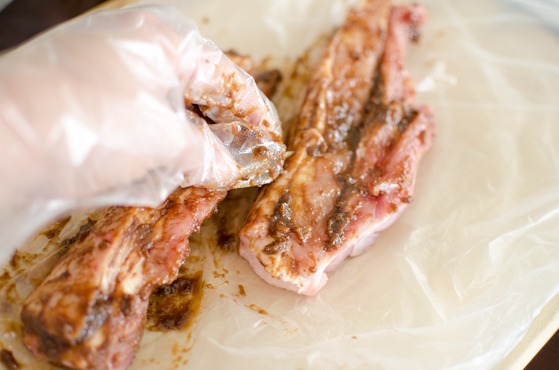 Are there any pointers you could give to help stick the marinade to the meat during cooking? 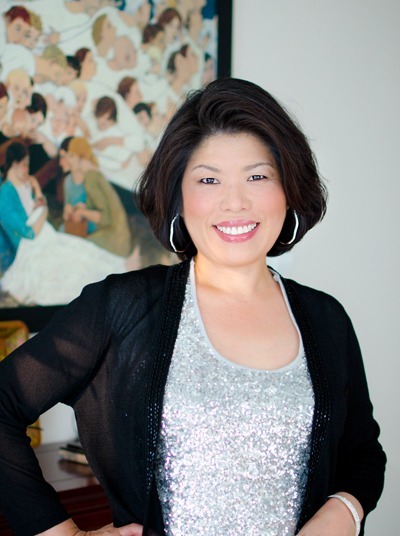 Holly, your blog contains a wealth of yummy recipes. Thank you!